Part of our function is working in collaboration with our academic departments to support appropriate use and research of technology in learning and teaching. Some of these projects might prove beneficial to and benefit from the input of other team and individuals. 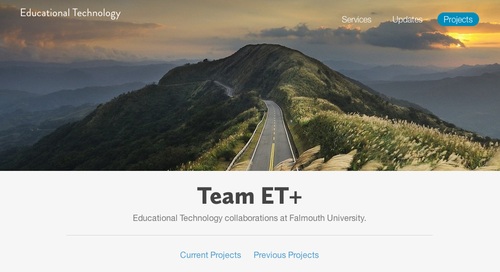 Team ET+ documents our current and past collaborations within and external to Falmouth University. With a simple breakdown of the What, Why, Who, When and Where of each project accompanied by relevant multimedia and documents, we aim to make it easy to understand who to talk to and how to get involved with our collaborative work. If you’re working on a learning or teaching project that might benefit from advice and support in using technology get in contact.